First Solar (NASDAQ:FSLR) beat Q209 earnings yesterday and the stock shot up in after hours trading cresting at around 190. But as the earnings conference call started and CEO Michael Ahearn and CFO Jens Meyerhoff spoke, the stock tumbled quickly. Cautious optimism? While Ahearn and Meyerhoff did not change guidance for the next quarter, they both spoke of challenges in balance of the year, which on the face of it was prudent and transparent. I like that about these guys; they are practical and forthcoming. Yesterday's call, however, struck me as more dour than usual. And judging by the reactions, others seemed to agree. The biggest concern moving forward appears to be the rather defensive position FSLR execs are taking in Germany, as polysilicon prices continue to fall making crystalline silicon (c-Si) module prices competitive with FSLR's cadmium telluride (CdTe) modules in Germany. While this will affect their margins for some time to come, I'm still confident this company has real value, strong leadership, and a great product. Analysts this morning have been all over the map, from CreditSuisse's downgrade to $135 (from $200) to Wedbush Morgan's upgrade price of $195 from $175. And it's been a bouncing ball all morning after opening at $155. For me, I don't think the sun has set on First Solar just yet. Science Daily reports today on a landmark study of threats to biodiversity and species extinctions across Australia, New Zealand, and the Pacific Islands. "Published in the international journal Conservation Biology, the report is the first comprehensive review of more than 24,000 scientific publications related to conservation in the Oceanic region. Compiled by a team of 14 scientists, it reveals a sorry and worsening picture of habitat destruction and species loss. It also describes the deficiencies of and opportunities for governmental action to lessen this mounting regional and global problem." * Loss and degradation of habitat is the largest single threat to land species, including 80 percent of threatened species. * More than 1,200 bird species have become extinct in the Pacific islands and archipelagos. * In Australia agriculture has modified or destroyed about 50 percent of woodland and forest ecosystems, and about 70 percent of remaining forests are ecologically degraded from logging. * Invasive species, particularly vertebrates and vascular plants, have devastated terrestrial species of the Pacific Islands and caused 75 percent of all terrestrial vertebrate extinctions on oceanic islands. * More than 2,500 invasive plants have colonized New Zealand and Australia – representing about 11 percent of native plant species. * Many invasive weeds, vertebrate pests, and fishes were introduced by government, agriculturalists, horticulturalists and hunters. EDF Energies Nouvelles (EDF EN) and First Solar, Inc. (Nasdaq: FSLR) today announced a venture to build France’s largest solar panel manufacturing plant. With an initial annual capacity of more than 100MWp, the plant will produce solar panels made with First Solar’s advanced, thin-film photovoltaic technology. According to a press release today, First Solar will build and operate the plant in France, representing an expected investment of more than €90 million. The initial annualized capacity of the plant is expected to exceed 100MWp, according to FSLR, making it the largest manufacturing facility for solar panels in France. EDF Energies Nouvelles has agreed to finance half of the capital expense and plant start-up costs and will benefit from the plant’s entire output for the first 10 years. First Solar and EDF EN intend to announce their decision on the site location within the next few months. First Solar’s manufacturing site will also include a facility for recycling solar panels, France’s first such facility and Europe’s only solar panel recycling plant outside of Germany. Where's the Beef: Will Banning Amazon Beef Doom the Rainfrorest? Veteran conservationist David Cleary knows what's critical for protecting the Amazon: beef. Cleary, the director of conservation strategies in South America for The Nature Conservancy, lived in the Amazon for over a decade and he knows that "the most important driver of deforestation in the Amazon is ranching, with pasture having replaced more than 80 percent of the Brazilian Amazon cleared since reliable satellite records began, in the early 1980s." As Cleary writes in his Cool Green Science blog post this week, "There are good reasons why ranching thrives in the Amazon: land is free or cheap in most of it, cattle need minimal care, and they can walk to market." 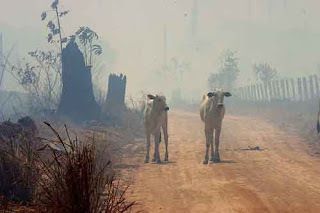 But efforts to green the beef supply chain always fell short, Cleary says, until last month when "Friends of the Earth in Brazil and Greenpeace in Europe came out with separate reports detailing the role of the beef industry in driving Amazon deforestation. There was a media firestorm. Within days, all the major Brazilian supermarket chains (Carrefour and Walmart among them) announced new policies banning the purchase of meat linked to deforestation in the Amazon." Cleary contends that while this is a milestone, it could quickly turn into a millstone if the market for Amazon beef shifts elsewhere. "The problem with trying to inject conservation into commodity markets is that they’re global," writes Cleary. "The danger with the Greenpeace/Friends of the Earth approach is that it cuts off access to markets that could change the behavior of producers and influence them to stop deforesting." The trick, Cleary argues is "getting beef markets to work in a way that brings deforestation down, instead of simply switching the markets and consumers that drive it." The Ashoka's Changemakers community has selected three winners in its global search for innovative solutions to rural development and sustainable agricultural issues. Earlier this month I wrote about the ten finalists. The winners, one each from India, Uganda and Brazil, cover traditional farming methods, female farmer empowerment, and integrated farming for small farms. In Uganda, Dr. Mwalimu Musheshe helps smallholder farmers share and benefit from traditional farming methods through the Uganda Rural development and Training Programme. Property rights and land ownership is something we take for granted in the west. Farmers across rural developing nations, however, farmers, especially women farmers, have little or no access to such ownership, which negatively affects their ability to pursue their livelihoods, feed their families, and send their kids to school. Now an Indian organization known as SRREOSHI puts land into the hands of groups of women farmers in West Bengal, a positive step to protecting women's rights and giving them control over the land they are cultivating. The third winner is Agência Mandalla DHSA of Brazil, which promotes an integrated farming system employing the latest appropriate technologies and farming methods to small farm plots in both rural and urban areas. Support from competition sponsors the Bill & Melinda Gates Foundation provides each of the winners with a $5,000 prize and collaborative support to expand their work in rural agriculture and development. The Gates Foundation's Agricultural Development Program has a larger partnership with Ashoka to find the best innovations in rural development and agriculture. "Being recognized among the most innovative solutions for rural communities is a pretty big achievement for us," said Tarcio Handel da Silva, Executive Director of Agência Mandalla DHSA. "It has maximized our motivation to keep replicating our work in knowledge and social change." The Wal*Mart Game-Changer: How Green is Your Sustainability? I've said it before and I'll say it again, if anyone can make the transition to the new green economy work, it is Wal-Mart. Oh, some argue that they are the evil empire, with their huge building footprint and their aisles upon aisles of cheap, sometimes useless stuff. Others will ask, why don't they treat their workers better or their small business competition? But no one can argue that the latest move by the bargain-dealing superstore isn't a game-changer: Wal-Mart is launching a Sustainability Index. A Sustainability Index? That's right. Wal-Mart plans to track and rate the life-cycle of every product it sells in its stores and list the results on the shelf. According to an article by Marc Gunther on Slate's The Big Money, Wal-Mart has been working with a consortium of consumer-goods manufacturers and universities to develop this index. Wal-Mart's new CEO Mike Duke will unveil the Index this Thursday, July 16, at the company’s corporate headquarters in Bentonville, Arkansas. Measuring sustainability all up and down a product's chain is tough, especially if you factor in "people and communities" to the index, as Gunther reports is Wal-Mart's intention. But if anyone can do it the Bentonville Behemoth is probably up to the task. Kudos to Wal-Mart for taking this next step. Let's hope it works and really changes the game. Perhaps it was the smiling French President Nicolas Sarkozy reaching out to grab Mr. Obama's arm, as if he'd just told the best joke the Frenchman had heard from an American since Jerry Lewis. Or perhaps it was the beaming German Chancellor Frau Merkel giving an appreciative glance at the charismatic American president. Or maybe it was British Prime Minister Gordon Brown calling the G-8's non-binding agreement "historic" and German Chancellor Angela Merkel pointing to "a clear step forward." I couldn't help wondering whether the G-8 summit in the central Italian city of L'Aquila wasn't a well-orchestrated jab at the previous US administration and its resistance to 80 percent reductions. It all felt a little cloying. At the end of the day, the US and other G-8 nations have pledged to reduce their greenhouse gas emissions by 80 percent or more by 2050, and agreed that global temperatures need to be prevented from rising more than 2 degrees Celsius or 3.6 degrees Fahrenheit. Of course, not everyone was happy with the agreement. Both environmentalists and developing nations took issue. While environmentalists welcome the shift in US policy, they are critical of the big industrial emitters' failure to agree on more immediate goals. Developing nations feel that complying with major reductions will hamper their economic growth and keep their people in poverty. According to sources close to the situation, representatives of developing nations, such as China, India, and Brazil still feel those who have benefited from 100-plus years of unbridled development should do more. In other words, the burden of emissions reduction should be on those who created the problem, not on those who are struggling to catch up. There is no question that China and India will be a major force in the upcoming negotiations. They have much at stake: both are still heavily reliant on coal to fuel their economies, but both also seem to be serious about investing in alternative energy development. China and India seem to be serious about developing a low-carbon economy -- or at least seizing a large share of the market. Last month, Zhang Xiaoqiang the vice-chairman of China's National Development and Reform Commission, said that China wants to produce one-fifth of its energy needs from renewable sources by 2020. According to Lou Schwartz, of China Strategies LLC, the Chinese will spend over 3 trillion Yuan (roughly US$462 billion) on alternative energy development in the next decade. This includes 100,000 MW of installed wind power capacity by 2020. Meanwhile, in a visit to the Solar Energy Centre in Gurgaon last month, Indian Minister for New and Renewable Energy, Dr. Farooq Abdullah, pledged that "new and renewable energy will increasingly play a larger role in meeting the development aspirations of a growing economy like India." The US and other G-8 countries need to take notice, listen to the concerns of developing nations and do more to enable those countries leapfrog dirty technologies, while doing more at home to facilitate their own swift transition. Ashoka's Changemakers announced the top ten finalists in their "Cultivating Innovation, Solutions for Rural Communities" competition. In February, Changemakers launched a global search for innovative solutions to often complex issues facing rural development and sustainable agriculture, from food security to sustainably scaling-up production. Sponsored by the Bill and Melinda Gates Foundation, the competition uncovered 455 ideas from around the globe. The judges have settled on ten finalists and now it is up to you and the Changemakers community to vote to select three winners. But hurry: the voting closes on July 8th. Changemakers is a community of action where participants helped develop and refine and select solutions through a collaborative competition model.